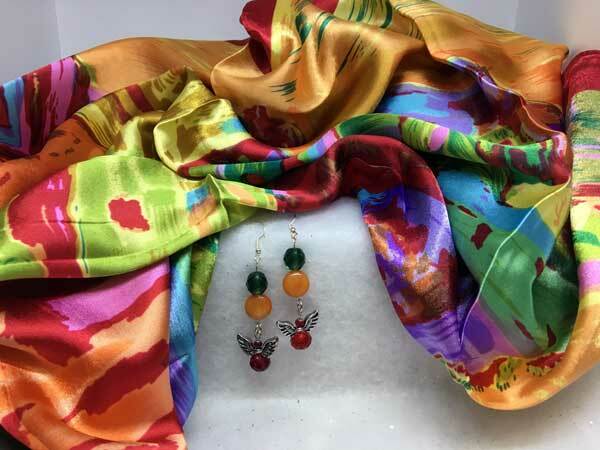 This 100% silk scarf is loaded with vibrant color It measures 34 inches square, for lots of styling options! This one has a blood red border and the beautiful array of colors include: reds, oranges, pinks, purples, blues, greens, olive and gold. The earrings hang just over 2" from the finding loop. They start with a large, fully-faceted, emerald-colored glass round sitting atop a medium orange glass coin. Hanging separately from this is an angel made up of a small and large fully-faceted ruby-colored rondelle. If you love a lot of vibrant color, this set is for you!